Lose 50 pounds by next Father's Day (2014). Crazy idea? Sure. But a goal without a deadline is just a dream, right?! I'm happy to report that after one year...I reached my goal! I lost 50 pounds. Typing this doesn't sound true. Last year at Father's Day I weigh 230 pounds. This year, I weighed 180 pounds. Habit matters: I'm a creature of habit; so are you. What we do daily is what matters. Don't think in terms of weekly or monthly about your health; think daily. Heck, think hourly. Pick a time of day that works best for you, preferably when you have the most energy, and exercise. Let nothing get in your way. This is you-time! With P90X3 there's one rest day per week. For me, the one day off each week is still a time to be active. If I'm inactive for one day, I want to be inactive for two days. Water is key: I've written and talked so much about water I'll spare here, just know that without drinking massive amounts of H20 you will not reach your goals. Why? Mostly because you'll be hungry and more likely to consume salt, sugar, tables, chairs, lawn equipment and the like. Also, you can forget exercise because you won't have the energy for it. Diet matters too: See my water post, but also, eat about a third of what you are now. If you're obese and reading this post, my guess is that you, like me, became obese by eating too much of too many bad things at too many times—and not drinking enough water. Oh, and be active: Whether it's 15 minutes, 30 minutes, or an hour, being active changes everything. Trust me, you may not feel like doing anything but sofa-planking, but once you start doing something, you'll feel better. This comes in time, I promise. Mentally: I'm pretty sure my wife would tell you I'm happier now than 90 days ago. I say "pretty sure" because I'm still a stressed-out jerk about stupid stuff I can't control. But, daily exercise gives me moments of euphoria you might call "happiness". Eating right for a span of a few meals and snacks has the same affect. If you feel more energetic, you'll probably feel like doing productive stuff. I'm more alert and have noticed moments of deeper concentration. I'm accomplishing more at work and working more efficiently. It's like taking the Limitless pill NZT except I can remember what I've done instead of waking up in a torn suit on the Brooklyn bridge. Y'all have seen that movie right? Nevermind. Weight: Lost 18 pounds—from 198 to 180. Chest: From XL (Extra-Large) shirts to L (Large). Also, went from super-snug 44 blazer to slim fit 44 (could get away with a regular 42!). Waist: From snug 38-inch pants to loose 34's (almost to size 32's!). Face: My face is no longer round: this is good because my face was never supposed to be round. Feet: My feet no longer hurt. I used to complain about my shoes; but the shoes weren't the issue. Now, even when I spend all day walking in flip-flops, my feet aren't hurting. Hello, barefeet summer! Hands: My wedding ring fits. I was convinced my wedding ring was becoming smaller. Now, it fits like the day Tonia lovingly placed it on my finger. PS: Fingers shouldn't swell or change much over the years unless there are possible health issues. Read the signs, brothers and sisters. In the last year, but especially in the last 90 days, I have gone from obese to overweight. In the next 90 days (I've already started a second round of P90X3), my goal is to go from overweight to fit. But for now, I have to be excited and feel encouraged (see pics here. sign-in required). Within 90 days, I'm ready to be in the best shape of my entire life. I wish nothing but the same for you. Note: No dad was paid for this post. We were, however, given a base kit and two kits to giveaway because the Beach Body folks are so awesome. We'll hand-select one winner who uses #P90X3Dads on social media or comments on the blog. 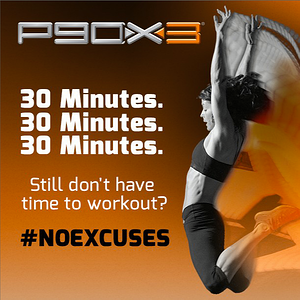 Tell us: What would a free copy of P90X3 do for you?